Neela (Sandhya), a dancing girl, is seen doing a cheap dance by an old time Guru (Keshavrao Date) and his son and disciple, Girdhar (Gopi Krishna). Chastised by the Guru and shown what real dance is by Girdhar she sees a new meaning in dance and begs the Guru to teach her. He tells her it will be a hard task but she is willing. Girdhar and the Guru stay in her place, where her maintenance is paid for by one of her admirers, Mani Babu (Madan Puri). As Neela and Girdhar begin their training for a prestigious dance festival, the two of them also fall in love. The Guru is furious as he is totally against any display of any emotion by the artist other than devotion to his art. Neela withdraws from Girdhar’s life making him hate her and even tries to kill herself but survives. She gives up everything so that Girdhar may excel in his art. Now that Girdhar needs a partner, the Guru and Girdhar decide on Roopkala, a dancer who had trained under the Guru but had corrupted his art. Holding Girdhar responsible for Neela spurning him, Mani Babu buys off Roopkala who refuses to dance. As Girdhar is alone and about to be disqualified, Neela reaches there and performs the Shiv-Parvati dance with him. The Guru relents as he realizes the hardships Neela has undergone and he reunites the lovers. With Jhanak Jhanak Payal Baaje, V Shantaram once again proves his ability as a master filmmaker as he combines an extremely well written screenplay with the dance element of the film. With this film, his first foray into technicolor Shantaram, proves that you can turn to your own culture and come up with a superb, engrossing, thought-provoking and well-crafted film. Jhanak Jhanak Payal Baaje is a film which propogates that India must preserve her artistic purity and not be swayed blindly by ‘westernization’. The film is a tribute to the Classical Dances of India. From lessons in Kathak to Yaman Raag to Dance of the Seasons to the Shiv Tandav sequence, the film is a series of sparkling vignettes and gorgeous ensembles of Kathak, Bharatnatyam and Manipuri. The nascent romance is keyed to the performance of the romantic Radha-Krishna number in traditional Kathak style and as it grows, it exposes itself in the wild joy of the Bhil dance, staged in association with the late Thakkar Bapa’s Varanasi Seva Mandal Troupe. It finally blossoms amid the ecstasies of Bhartanatyam in Mysore’s famous Brindavan Gardens. True, the film is a feast of Indian Dance but never moving away from the core story, which is, in fact, an essential part of a tender romance of the Guru’s disciple. This romance ripens into love and is turned into drama and near tragedy before resolving itself happily at the end. Certain sequences intermingling with the dance and drama are extremely well conceptualized and carried off with flair, the highlight being the Shiv Tandav sequence where Girdhar sets the screen ablaze with his dancing. 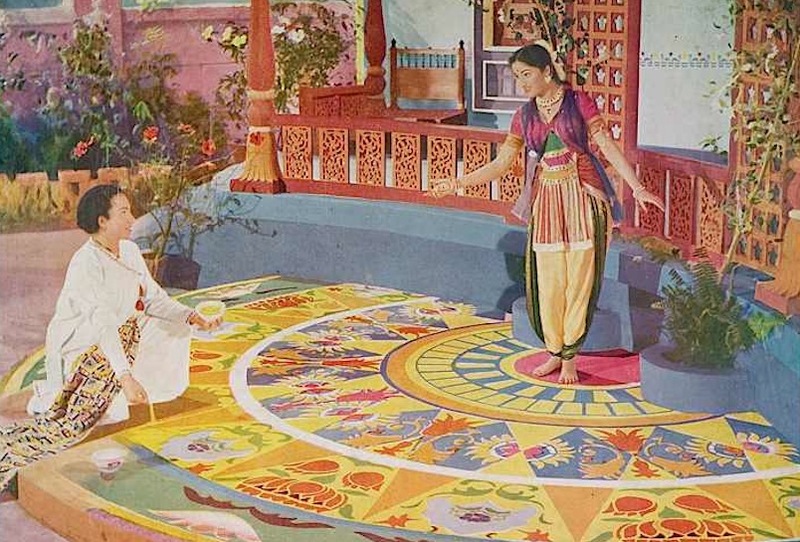 Gopi Krishna and Chaube Maharaj combine to create a virile dance, which is enhanced several notches with its perceptive camera angles and skillful use of spot lighting.This intermingling of life with art also heightens the drama and gives the film more depth and layering, thereby making for enriched viewing. As expected, Gopi Krishna is the life and soul of the film as long as he sticks to what he knows best – dancing. His dances are the film’s strengths as he makes the viewer realizes the richness and artistry involved in Indian Dance. Shantaram, who was a perfectionist, made Sandhya train for two years before he began the film. Sandhya tries hard but lacks the natural talent in both acting and dancing and one cannot help thinking what wonders a seasoned actress-dancer like Vyjayanthimala would have done with a role like this. Of the rest, Keshavrao Date, Manorama and Bhagwan lend fine support. The brilliant choreography, sets and costumes of the film deserve a mention even if admittedly the team did get carried away with the fact that the film is in color and the look is extremely garish with a plethora of saturated colors, reminding one more of Indian Calendar Art, but Shantaram makes great cinematic use of it with dynamic camera movements and shot taking that highlight his mastery over the medium. The other strong point of the film is its lyrics and musical score. Hasrat Jaipuri has done some of his best work in this film with soulful lyrics like Nain So Nain and Ae Mere Dil Bata. But above all, the film is a triumph for Music Director, Vasant Desai. Desai was a regular with Shantaram. He began his career at Prabhat as an actor and a studio hand in 1929. 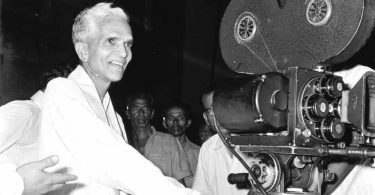 He then became assistant to the music directors there like Keshav Rao Bhole, Master Krishna Rao and Govingrao Tembe. Desai is best known for mainly adapting traditional Maharashtrian musical modes of Powada and Lavani and made several polemical statements calling for Marathi Cinema’s return to regional music traditions. 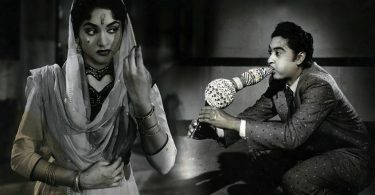 It is said that following the success of Baiju Bawra (1952), where Naushad so successfully incorporated Indian classical music into mainstream Hindi cinema, Shantaram was advised by well-wishers to take Naushad to score the music for the film. Thankfully, Shantaram was adamant and stuck to Vasant Desai who responded with perhaps his career’s best ever score! The music mingles the rhapsodies of the flute and soft outpourings of the sitar to highlight or subdue, as the case might be, the interludes in which the lead pair hold the stage as lovers. An interesting point is the absence of Raag Bihag, which is actually associated from time memorial with separated lovers and here the film refrains from using it even though the lovers do get separated before reuniting at the end. Vasant Desai, like Naushad, proves how accessible Indian Classical music can be and repeated his success story in Goonj Uthi Shehnai (1959), which had the great Bismillah Khan playing the shehnai! Jhanak Jhanak Payal Baaje was written off by some critics but the public responded most favorably to the film as it ran for over two years at a theater in Mumbai and even went on to win the President’s Gold Medal for Best Feature Film of 1955.It also won 4 Filmfare Awards for Best Film, Director, Art Direction (Kanu Desai) and Audiography (AK Parmar). In 1959, Shantaram returned to another film combining dance this time with fantasy – Navrang, about an artist who glamorizes his wife in his fantasies as his muse. Though critics like Baburao Patel of Filmindia dismissed the film as ‘the mental masturbation of a senile mind’, the public once again responded enthusiastically to the film making it a success at the box-office!